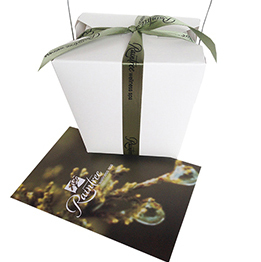 53 percent of guests enjoyed shopping online (convenient; no waiting in line; customizable gift card), while 47 percent preferred the ability to purchase in person (cash payment option; get help choosing a treatment; liked the gift box).100 percent of guests visiting for treatments in December expressed their appreciation of a calmer atmosphere (the reason we implemented this policy). However, the majority of these same guests who received a Raintree gift card at Christmas mentioned how much they missed our signature gift box.So what does this mean? Is it all about the box? Not really (although apparently, Tiffany & Co is not the only contender for box recognition); it’s about receiving the Raintree experience year-round.We appreciate how hectic the holiday season can be, and providing a serene atmosphere when you visit for a treatment is of utmost importance to us. However, providing a customer-focused atmosphere when guests visit for any reason is also important to us. With this in mind, we look forward to seeing you in person, as well as online, for future gift card purchases. Thank you for your feedback and support in helping us provide the best possible experience for all our guests.